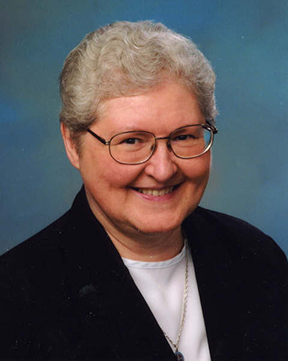 Sister Rebecca Mayer, 78, a Benedictine Sister of Annunciation Monastery, Bismarck, entered eternal life on December 29, 2015. Mass of Christian burial is scheduled for 11 a.m., Saturday, January 2, 2016 in the Chapel of Annunciation Monastery. Visitation begins Thursday, December 31, 2015 at 2 p.m. at the monastery and continues until the time of the funeral. A vigil will be held at 7:30 p.m. Friday, January 1 in the Chapel of Annunciation Monastery. Sister Rebecca (baptismal name Irene) was born to Joseph and Rose (Harle) Mayer on Sept. 1, 1937, in Mott, N.D. She grew up on a farm with a sister and two brothers. She first thought of becoming a sister at age 12 when one of her teachers spoke about the call of religious life. After high school graduation, she entered Annunciation Monastery. As a novice she received the name, Rebecca. Sister Rebecca made her monastic profession July 11, 1956. Music and liturgy were at the heart of Sister Rebecca’s life. She earned a bachelor’s degree in music, a master’s in music education and a master’s in music and liturgy. Such an extensive background in music, composition and worship opened many doors to her. She taught music at Cathedral School, Bismarck, St. Joseph’s School, Mandan and St. Patrick’s School, Dickinson. For 10 years she served as associate director of the Office of Worship for the Diocese of Bismarck and was a member of the diocesan RENEW team which implemented faith development processes in the diocese. Sister Rebecca also spearheaded a major undertaking by the monastery’s worship committee to create 10 volumes of new prayer books for the Sisters of Annunciation Monastery. It was a 10 year labor of love beginning in 1990. Many of Sister Rebecca’s musical compositions are in those books. She is remembered with gratitude every time those texts are sung and every time the sisters use the books for prayer. Sister Rebecca served as a member of the Board of Trustees at the University of Mary, the lay advisory board for Garrison Memorial Hospital and was currently assisting in the monastery’s development office. She was organist in every place she lived and worked, most recently at St. Alexus Convent and CHI St. Alexius Health chapel. Sister Rebecca is survived by her brothers, Clifford (Karen), Oxnard, CA; Vernon (Barbara), Bismarck; and her nieces, nephews and their children and the Sisters of Annunciation Monastery. Memorials may be given to Annunciation Monastery.